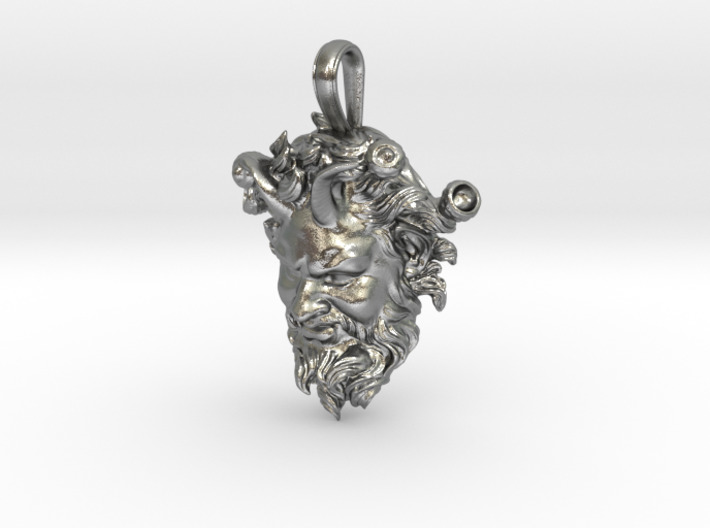 This pendant is an extremely accurate 3D laser-scanned, 3D printed, and hand-cast reduction of the face of the bronze Dancing Faun of Pompeii, which was found on October 26, 1830 in the ruins of the most opulent Roman home discovered at Pompeii—the House of the Faun, as it later became known, which was also home to the Alexander Mosaic. 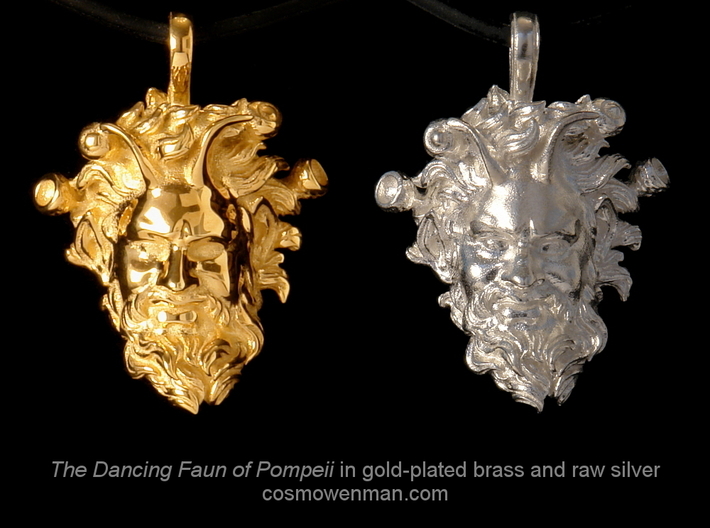 The Faun is thought to be either a 2nd-century Greek original, or a very high-quality Roman copy. 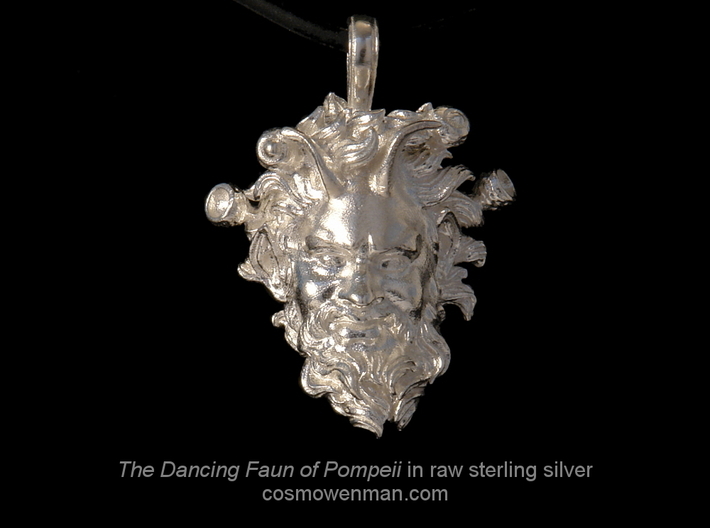 Upon its discovery, as Francis Haskell and Nicholas Penny write in Taste and the Antique, "The fame of this small bronze was instantaneous ... its first cataloger described it as the finest bronze to have been excavated at Pompeii and compared it to the Barberini Faun." 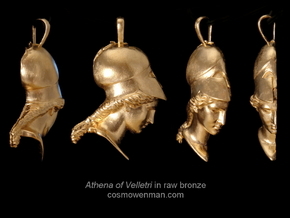 The original has been housed at the Museo Archeologico Nazionale di Napoli ever since its discovery. 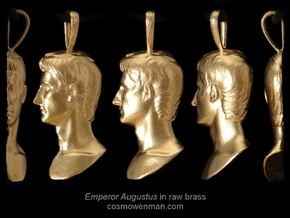 The Faun's small size made it ideal for reproduction and for decorating gardens and drawing rooms. Victorians raved about the Faun, no doubt with assurances like that from the Naples museum, which advised that "the Faun was ecstatic and not in the intoxicated condition of various other bronze Fauns from Herculaneum and Pompeii…"
His smiling face is framed by his wild beard, hair, and goat horns, and is decorated with a wreath of acorns. 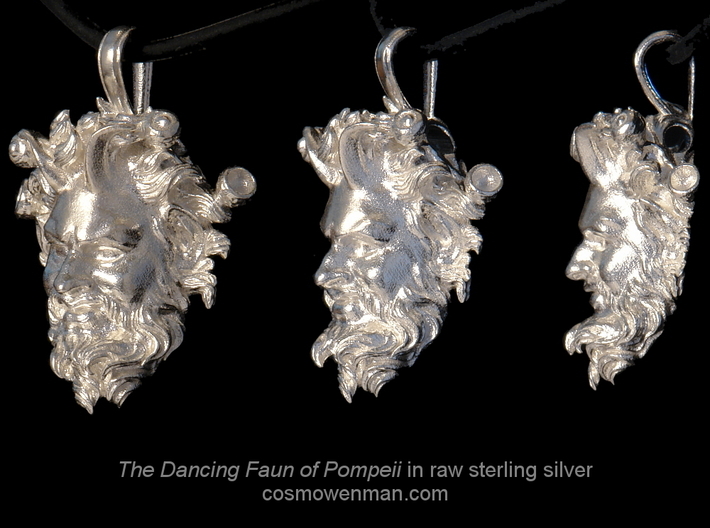 In 2013 I spent a week working at the Skulpturhalle Basel plaster cast museum in Basel, Switzerland, where I 3D laser-scanned a high fidelity 19th-century plaster cast of the original Dancing Faun of Pompeii. 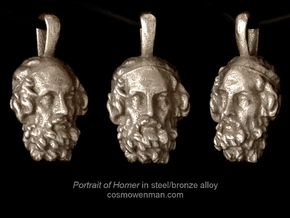 I’ve now prepared the resulting 3D data—the first of its kind—for 3D printing wax patterns which are then hand cast in a variety of precious and semi-precious metals in the traditional lost-wax casting method. 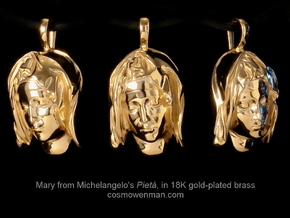 A 2,200 year-old design, you can now wear the Faun's smiling face around your neck, in a variety of materials.